It started with a blog post that Paul Kingsnorth published on 8 September 2007, announcing his resignation. When you work as a freelance journalist, it’s not obvious to whom you should direct a letter of resignation, but publishing it on the internet is one answer. That post was an eloquent, angry howl: a testimony to a loss of faith in the trade to which he had given the previous twelve years of his life. A publication which will match the beauty of its writing with the beauty of its design. A publication whose mission will be to reclaim beauty and truth in writing, but without sounding too pompous about it. A publication which will reject both celebrity culture and consumer society with equal vehemence. A publication which will celebrate our true place in nature in prose, poetry and art; which will hunt down ancient truths for modern consumption. What I really need are collaborators; fellow writers and artists who see a space out there for something deeply, darkly unfashionable and defiant, and who would like to help make it happen. This is a long journey, I imagine, which begins here. I need people of integrity and ideas to help me shape it and make it happen. In September 2006, Dougald Hine had walked away from his own career as a journalist at the BBC. The cycle of newsroom reporting felt too much like an industrial process: a production line in which the raw experience of people’s lives served as material for the commodity called news. He was looking for another way of telling stories. So when, a year later, he read Paul’s resignation post, it echoed enough of his own experience to make him curious. He decided to write to this Kingsnorth guy and see if there was something they could do together. If Paul brought an established reputation as an environmental writer, a fierce lyricism and a determination to write as honestly as possible about his own doubts and fears, then Dougald’s contribution to the beginnings of Dark Mountain was his experience of bringing people together around projects, along with certain questions he’d been carrying for years about the role and power of stories. Those questions had grown out of his university studies in medieval and early modern literature: somewhere along the journey to the modern world, the indirect ways of knowing that had once been the means of approach to the largest and most difficult aspects of experience had been put away, demoted to the status of children’s stories and old wive’s tales, for reasons that were tangled up with but not justified by the rise of science. In another time, he might have followed this line of thought into an academic career, but instead he was drawn into a network of artists, activists, technologists and thinkers experimenting with non-institutional spaces of learning, places with names like the University of Openness or the Temporary School of Thought. Out of one of these experiments, there grew a project called School of Everything, an internet startup inspired by Ivan Illich’s Deschooling Society. It was this project that Dougald had thrown himself into after leaving the BBC – and so, before Dark Mountain came along, he was already focused on how the internet could be used to bring people together face-to-face. I recognise the paradoxical sense of hope that accompanies the loss of faith in the political system and all the official channels through which we’re meant to try to ‘change the world’. To a lot of good people, this sounds like heresy. Yet I’m heartened by the range of deep and thoughtful voices that have tried or are trying to articulate what things look like from here. What interests me is that these writers come from such a range of traditions, write in different styles and for different kinds of publication, would disagree over plenty of things, but seem to share an unnamed affinity. I’d love to see a publication which grew out of that affinity – and if this sounds remotely like what you’re planning, then I’d like to help. The idea for a publication had been fermenting slowly, Paul replied: ‘It’s still not yet drinkable by any means, but I think I’m getting somewhere!’ And it felt like they were close enough in their thinking to be worth exploring this together. I would like to produce something which looks at humanity in the round; steps outside the bubble of our civilisation to the real, wild world beyond; challenges human behaviour and ambition. I would like to promote what I have started calling ‘uncivilised writing’ – a clunky term, but one which is intended to describe writing which acknowledges our true place in the world, and writes from beyond the vantage point of a ‘civilisation’ which rapes the non-human world and enslaves our minds. I don’t want dogmatism; I want a search for beauty and truth, an acknowledgement of the compromises we make in searching for it, but overall an attempt to look at our world in a different way. Your idea of ‘uncivilised writing’ triggered a train of thought about ‘uncivilised politics’. Strictly speaking, this is an oxymoron – politics, like civilisation, being urban by definition. For me, it suggests the deeply radical perspectives which open up when you step outside the city limits, beyond the pale of ‘political reality’, and recognise just how different the world looks with other sets of assumptions. This ‘stepping outside’ is associated with the shamanic figure evoked by Alastair McIntosh, identified by Garner as the “mearcstapa” or boundary-walker, echoed in Illich’s description of himself as a “zaunreiter” or hedge-rider (an old German word for witch) and an “extravagant” thinker, literally one who “walks outside”. There’s a rich, outlandish set of associations here. Boundary walkers, outsiders, hedge-riders – precisely! Precisely the people we should be writing for, the people we should be, the place we should be coming from. The idea of walking the edges, looking in on civilisation whilst being at the same time an inevitable part of it – a breakaway artistic republic of uncivilised thinkers and actors, rebelling against everything within that boundary, be it industrial society or mainstream ‘green politics’, but rebelling for a reason – this is precisely what I’d like to bring together. Not sure quite how! But probably these things evolve and can’t be planned. Months passed, Paul became a father, Dougald’s startup raised investment, they went on emailing each other. Then in May 2008, the conversation left the screen, as the two of them sat down together for an evening at the Isis pub in Iffley and began to get the measure of each other. Over the rest of that year, as the global financial system juddered and started to unravel, the two of them went on meeting like this every few weeks, and the thoughts jotted in notebooks or email bullet-points began to take shape as something that you could call a manifesto. On 17 July 2009, Uncivilisation: The Dark Mountain Manifesto was launched to a crowd of forty or so in a barn at the back of the same pub on the outskirts of Oxford where Dougald and Paul had met the previous year. The hand-stitched 20-page pamphlet, with an original print run of 300 copies, was published thanks to donations from friends and family. What really launched this project, though, was the response in the British press over the months that followed. It began with an exchange between Paul and the Guardian columnist George Monbiot, published that August, and then John Gray’s response to the manifesto in the New Statesman the following month. It’s not often a self-published, twenty-page manifesto is given a two-page lead review in such a magazine – and this coverage brought Dark Mountain to the attention of a wider audience more rapidly than it could have achieved otherwise. It also meant that many people’s first encounter with the project was at the level of ideas and arguments, devolving into comment thread slanging matches. There was little here to indicate that this was intended to be a cultural project, a gathering point for those ‘writers of all kinds, painters, musicians, sculptors, poets, designers, creators, makers of things, dreamers of dreams’ to whom the manifesto was addressed. 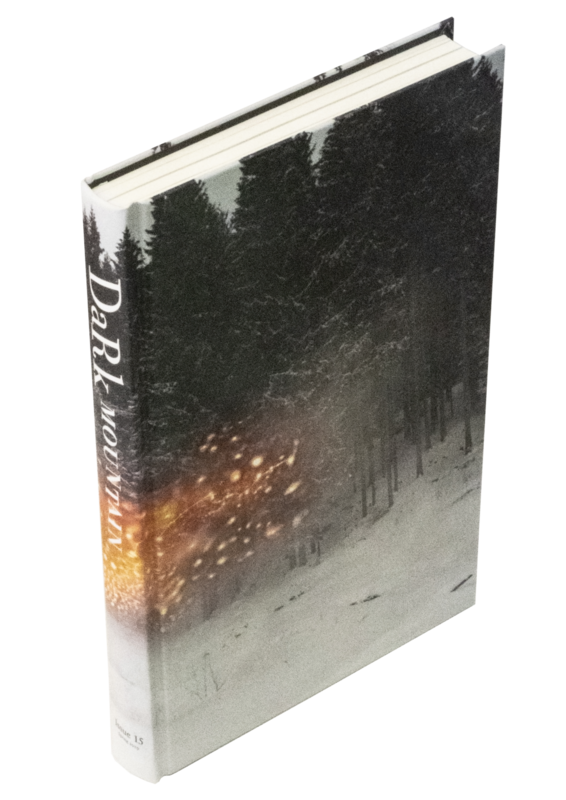 But among the responses coming in that autumn, there were those from writers and artists whose work would feature in the first Dark Mountain book, to be published in the summer of 2010. And meanwhile, there was one response that came to shape the development of the project so much that it is hard to imagine what Dark Mountain would have become without it. Michael Hughes had walked away from his career as a psychiatrist a few years earlier. He and his family were living in Llangollen, where he had become involved in a project to renovate the Royal International Pavilion, home to the International Eisteddfod. Michael had been in touch with Paul for a while, and out of their conversations came an invitation: why not bring together some of the writers, artists and musicians starting to gather around Dark Mountain and organise a weekend event as part of the Pavilion’s relaunch? We had never organised anything like this, and our hosts were used to organising comedy nights and concerts for local audiences who bought their tickets, sat in their seats, enjoyed the show, applauded and went home. We were unprepared for the logistics of a festival and unprepared for the ways in which a festival comes alive. There were a hundred things wrong: plastic beer in plastic cups, a campsite too long a walk from the venue, a main hall where rows of seats faced a stage where speakers could barely see for the dazzle of the theatre lighting. Yet somehow, in spite of it all, this became a place where magic could happen. Among the memories of that first year, there was the head-to-head encounter between Dougald and George Monbiot, which seemed to polarise the audience, only for them to be brought together again by Alastair McIntosh’s rhapsodic invocation of ‘the pilgrimage to the poet’s Dark Mountain’. The next morning, midway through Jay Griffiths’ talk, the brand new sound system broke down so comprehensively that the audience ended up leaving their rows of seats and sitting around her on the stage and the floor as she began again. And with that, a spell was broken, the face-off between speakers and spoken-to giving way to a shape as old as stories. ‘We got away with it,’ was Michael’s verdict afterwards. And for that reason, he went on, we should do it again next year and do it right. Together with Kat Dunseath, he put together a plan for how to run a Dark Mountain festival – and Uncivilisation found itself with a new venue, the Sustainability Centre in Hampshire, which would be its home for the next three years. Perhaps the most important consequence of the festival was that it became the gateway through which others found their way to the core of the project – and the place where Dougald and Paul began to step back, as others stepped forward, bringing the skills that were needed. By the final event in 2013, a larger collective was organising different parts of the festival, and many of those involved have gone on to run further Dark Mountain events or get involved in the publishing of the books. We didn’t set out to start a festival, a festival happened to us. From those who came to it, we learned more about what Dark Mountain might be and what it might mean than we could ever have done at our desks. It felt good to have created it – and it feels good now to have brought it to an end. It seems like everybody who comes is a maker or doer of some kind – singers and songwriters, poets and writers, but also hackers, healers, disaster engineers and renegade bankers … Again and again I found I could just sit down next to a stranger and very quickly we’d disappear down the rabbit hole – discussing peak oil or biotechnology, Hindu death cults or the problems with the publishing industry, prison reform or rap songs about cycling. All around, all weekend, people were meeting, talking and thinking, ideas crackling into the sky alongside the wood smoke and live music. Over the first couple of years, Paul and Dougald had run the project in their spare time, boosted by a team that came together around the festival – but by autumn 2011, it was becoming clear that this was unsustainable. Once again, it was Michael Hughes who stepped in, bringing together a funding proposal that led to a £10,000-a-year grant for the next three years from Doug Tompkins’ Deep Ecology Foundation. Paul now took on the role of editorial director of the project, while Sophie McKeand became its first editorial assistant. By this stage, Dougald had left the UK and settled in Sweden, continuing to be involved as an editor but having stepped back from the running of Dark Mountain. In spring 2013, it became clear that the project was heading for financial difficulties: with the third year of the Deep Ecology Foundation funding coming around, there was no likelihood of meeting the goal of becoming financially self-sustaining by the end of that period, and there was a risk that the project would run out of money within months. The downside of the crowdfunding approach was that a lot of effort went into reaching out to the same supporters each year, banging the drum for pre-orders and donations. At this point, Dougald returned to work as managing editor alongside Paul, launching a new annual subscriptions model that would become the core of the project’s ability to support itself. From now on, a clearer line would be drawn between the work of Dark Mountain as an organisation – publishing what soon became two books a year – and the wider tangle of creation and collaboration that had grown up around the project. Others joined the editorial team – Nick Hunt from Issue 4, Charlotte Du Cann as art editor with Issue 5, Steve Wheeler and Em Strang as poetry editor from Issue 6 – and Sophie McKeand handed on the administrative role which she had developed to Charlotte and Mark Watson, who would become the anchor members of the operational team. A feature in the New York Times magazine in April 2014 brought a new level of attention to the project in North America. Five years on from the publication of the manifesto, the Times could report that Dark Mountain was ‘changing the environmental debate in Britain and the rest of Europe’. The following year, Dougald was invited to work with Riksteatern, Sweden’s national theatre, running a year-long Dark Mountain Workshop to explore the role of art under the shadow of climate change. I leave this strange, messy, contradictory, wonderful, necessary thing I helped to birth in the hands of a group of people who I know will steer it onwards in new directions. There comes a point in any organisation when a founder, with his or her particular vision, has to step back to give new people and ideas some space to breathe. It’s time to do that now; to leave this thing to move on without me, and with my blessing. It seems a long time now since those early conversations over email and in the back rooms of pubs. This project has become a part of many people’s lives, travelling further than its founders ever imagined. It has often weighed heavily on the shoulders of those who have taken responsibility for it. But some days, it does feel like that ‘breakaway artistic republic of uncivilised thinkers and actors’, the collective of boundary-walkers and hedge-riders, that they were dreaming of back when all this started. The Spring 2019 issue is a collection of non-fiction, fiction, poetry and artwork that responds to the ‘age of fire’.